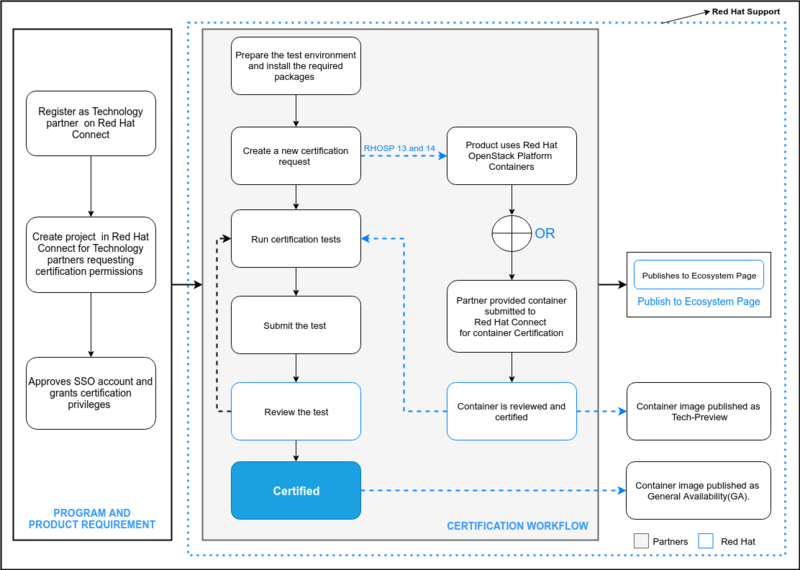 The following diagram represents the entire OpenStack Certification workflow along with the roles & responsibilities of Red Hat and the Partners. In your test server, launch Red Hat Certification web user interface in a browser using the http://<machine-IP> link. Type your Red Hat account credentials previously enabled for certification in the Username and Password fields. Click Login. Click the New Certification button. This will take you to Choose the Red Hat Certification web page. From the Product drop-down list, select Red Hat OpenStack Platform Plugin. The Version and Platform value gets generated automatically. However, partners can select the version, platform and RHEL version fields according to their requirement. Click Next . This will take you to Choose the product to be certified web page. Select the Vendor and Make items from the drop-down list. Click Next. This will take you to Common Questions web page. Provide the required information and click Create. This will take you to Create Red Hat OpenStack Platform Certification web page. Select the protocols and features compatible with your plugin. Click Create. A notification of the requested OpenStack certification gets displayed. The information which you provide in the Product Name and the Public Catalog URL fields is used by customers in locating the certified product entry (after a successful certification) on Red Hat OpenStack Certification Ecosystem Page.